Disclosure: I was sent this book for review. As always, my reviews are fair and unbiased. Rose, Ella, Marta and Carla. In another life we might have all been friends together. But this was Birchwood. As fourteen-year-old Ella begins her first day at work she steps into a world of silks, seams, scissors, pins, hems and trimmings. She is a dressmaker, but this is no ordinary sewing workshop. Hers are no ordinary clients. Ella has joined the seamstresses of Birkenau-Auschwitz. Every dress she makes could be the difference between life and death. And this place is all about survival. Ella seeks refuge from this reality, and from haunting memories, in her work and in the world of fashion and fabrics. She is faced with painful decisions about how far she is prepared to go to survive. Is her love of clothes and creativity nothing more than collaboration wth her captors, or is it a means of staying alive? Will she fight for herself alone, or will she trust the importance of an ever-deepening friendship with Rose? Review While I remember learning about concentration camps at school during History lessons, we never touched base on what it was like for the captors. In particular, these girls of The Red Ribbon, were prisoners held in the camps and forced into dressmaking. Although Ella, our main character, shares a love of clothes with the others, their passion is pushed aside and destroyed while they are commanded to collaborate together making couture gowns amongst the muddy landscape of their prison. As Ella, Marta, Rose and Carla become the seamstresses of Auschwitz, I'm truly taken by the element of sheer truth and believe-ability that has gone into the historical backdrop of these distressing times, particularly emotional for me (and I'm sure other readers) at various times. For a moment, I was wondering how such a deeply harrowing time in history could be conveyed as a Young Adult story, but Lucy does this with care, sensitivity and raw emotion that is suitable and readable for any reader from the early tween years. Overall, I just can't stop thinking about The Red Ribbon ever since I closed the last page. I am truly in awe of the effort, truth and pure brilliance that Lucy Adlington has put into this novel, with these fragile and broken, yet strong and kind, characters bound together in a time where they were forced apart. This is a truly mesmerising tale of hope, sacrifice and friendship and I loved it! Rating & Recs Perfect for YA and Adult fans alike! Now, for a special extract from The Red Ribbon! Imagine this: It’s your first day of work. If you don’t do well, you’re out. Once you’re out, you’re dead. You are literally working to survive. This is what 14 year old Ella faces in the nightmare world of Birchwood. Her fictional experiences are based on the real-life stories of young women prisoners in Auschwitz-Birkenau concentration camp during World War Two, where a select few were saved from death in order to work as dressmakers for their cruel camp guards and for fashion-loving Nazi officers’ wives. Ella realises she’ll have to toughen up quickly. She fakes confidence and skills to get a job in the Birchwood sewing workshop. ‘I pushed material under the new machine’s sewing foot and let the stitches run on and on and on, if only to hear the sound of my childhood once more. As it whirred away I was back in Grandma’s room, a little girl again, picking up pins from the carpet…’One of Ella’s biggest challenges comes as her friendship grows with gentle, heroic Rose. Rose is a dreamer, but without Ella’s fierce streak - a quiet hero who teaches Ella the power of love and hope. She gives Ella a red ribbon as a bond of friendship. In her quest to get home, Ella has to decide how far she’s prepared to go to survive. Will saving her own life mean sacrificing her values and her friends? 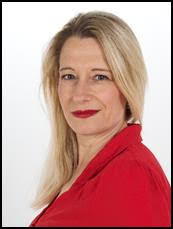 Lucy Adlington is a writer, actress and costume historian. Her novels for teenagers, written under the name L. J. Adlington, including The Diary of Pelly-D and Burning Mountain, have been nominated and/or shortlisted for the CILIP Carnegie Medal, the Manchester Book Prize,the Leeds Book Prize and the Rotherham Book Award. She also writes non-fiction for adults about the history of clothes, including Great War Fashion and Stitches in Time: The Story of theClothes We Wear. She founded the historical costume events company, History Wardrobe, has appeared on BBC Woman’s Hour discussing the history of underwear and she lives on a working farm in Yorkshire. She is currently writing a non-fiction book about women in the1940s. 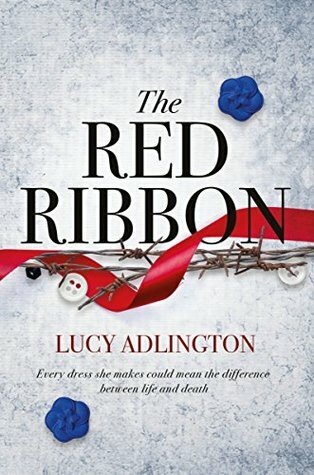 Have you read The Red Ribbon? Let me know what you thought in the comments or on twitter @LittleMemoirs! 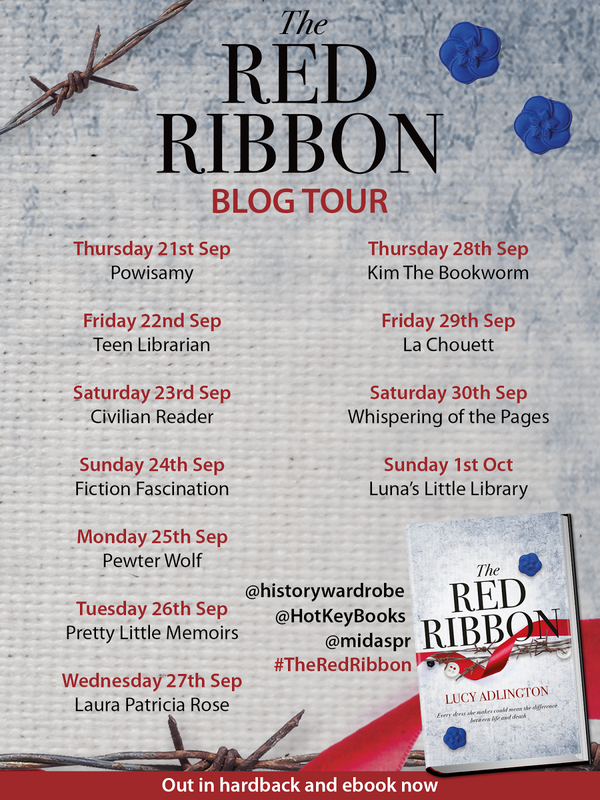 ALSO: join in the Blog Tour celebrations by tweeting your thoughts and use the tag #TheRedRibbon!